Robot designer Tatsuya Matsui seen recently in Tokyo with fashion designers showing off the Mori mannequin robot from FlowerRobotics. 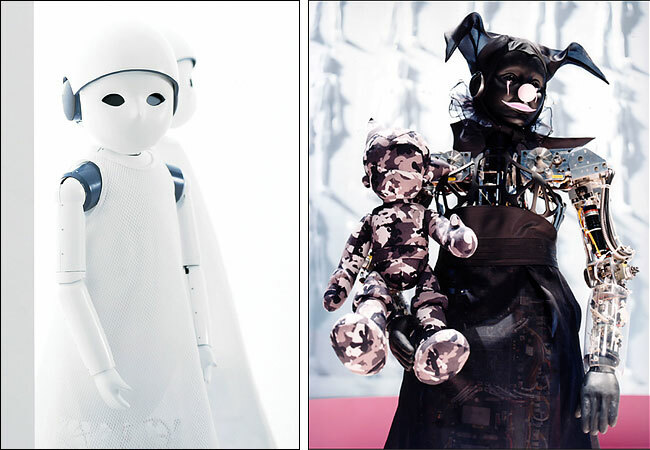 "Veteran Japanese designer Hanae Mori hates what automation has done to the industry. 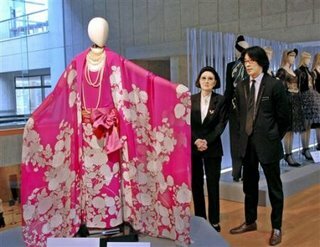 But bringing back her classic Chrysanthemum Dress after 40 years, she has enlisted a robot as her model. The robot, Palette, slowly moved her arms, body and head to show off the dress, while the other mannequins at the show were all planted firmly on poles. "The idea of using a robot for beauty is innovative, as robots are usually made for factories or wars," said Tatsuya Matsui, who designed the robot." Matsui will also be participating in the symposium New Design Japan: Cool Ideas & Hot Products at the Japan Society in NYC from March 18-20.